To add, view and process your employee's Leave Requests, open the Leave Admin page. If you cannot view the annotations please zoom in! You can toggle between different Leave Years, and Outstanding and Processed requests in the top left of the page. To filter and export your results, use the Filter and Export buttons in the top right corner. Select the Outstanding tab to view employee leave requests that need to be processed. To view details about the request, click on it to launch a new dialogue box. Here you can edit the leave request if required. You must adjust the duration of the leave request in the Duration Breakdown section to ensure the correct amount of the employee's annual leave allowance is used. Depending on your company's policy, employee requests will be measured in hours or days. 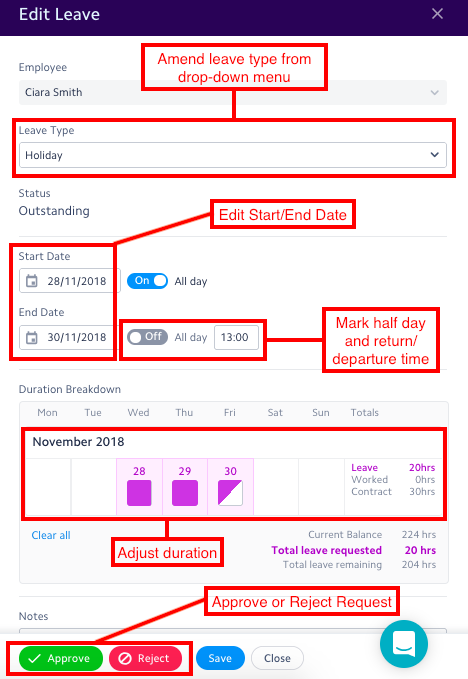 If leave is measured in days, you can record a whole day of leave, half a day, or no leave to be deducted from an employee's leave allowance. Where leave is measured in hours, managers must input the number of hours of annual leave allowance to be used each day. For example, an employee with a 5 day per week contract of 37.5 hours would use 7.5 hours of their annual leave allowance for 1 full day of leave. Once you've reviewed all the details and inputted the correct leave duration, click Approve or Reject. Click the blue + Add Leave button. This will launch a new window where you can enter the details of the leave request. On the Processed tab, click on the request you wish to edit. Amend the details as required and then click Save. If you want to reject a request that had previously been approved, open the approved request and click Reject. If an employee's leave request overlaps with another team member's approved holiday or breaches company policy, a warning or error will be shown to help the manager decide whether or not to approve or reject the request. Depending on your company's settings, you may not be able to approve leave requests that breach leave rules.